Our Redmond apartments are in a desirable location and neighborhood! Living at The Carter on the Park in Redmond, WA provides you with the opportunity to be near great restaurants, unique breweries and wineries, and some amazing parks and trails. 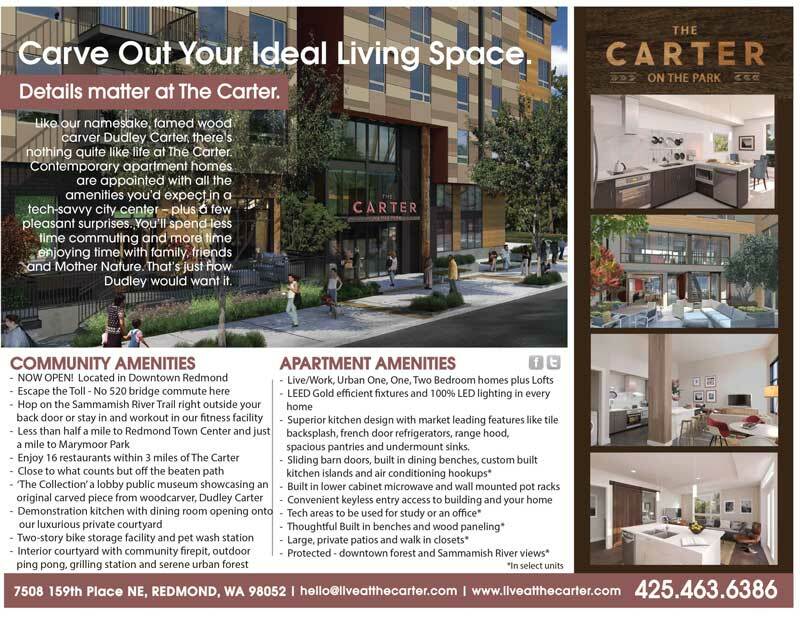 Also, if you’re looking for apartments near the Microsoft Redmond Campus, The Carter is just four miles away. Spend less time commuting and more time enjoying family, friends and Mother Nature. Hop on the Sammamish River Trail located right behind The Carter. Less than half a mile to Redmond Town Center and less than a mile to Marymoor Park. Enjoy 16 bars and restaurants (and counting!) within 3 miles of your home. Near the buzz of Downtown Redmond, but removed from the crowd. Enjoy the numerous wine producers in Woodinville Wine Country. The Carter is now open! Come take a tour of our brand new apartments and move-in today.